The 2016 Graduation Powwow takes place May 25 in the Bowl. 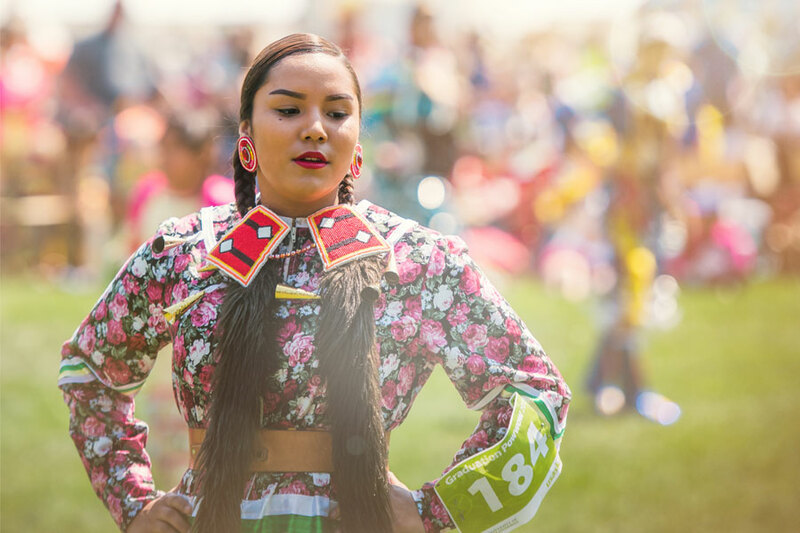 As with most traditions, the university’s first powwow started with a conversation. Now an annual event attended by thousands, it has a long, storied history dating back nearly 30 years. Rewind to fall 1987, when Tyrone Tootoosis was chatting with some fellow students about the absence of Aboriginal culture at the U of S.
"We were talking about the lack of a First Nations presence on campus," recalled Tootoosis, who also served as a member of the Indigenous Students' Council. Prior to this, he was involved in organizing other social ceremonies, so "it was a given that I would be asked by the students to chair and co-ordinate the powwow committee that was struck up and composed of First Nation and Métis students." That conversation was enough to get the ball rolling. Tootoosis, a group leader for Great Plains, a First Nations dance company, tapped into his connections and started planning. "I thought, perhaps, the singers and dancers would be willing to come and dance and sing at the inaugural event since we had absolutely no money to work with," he said. From that point, other details started to come together. A few drum groups and about 50 to 60 dancers agreed to show up, and the first grand entry ceremony was led by Cree Elder Henry Beaudry, a veteran of the Second World War as well as a former prisoner of war. Some aspects of organizing the powwow were challenging, Tootoosis explained. He had to get approval for everything—from using the Bowl, to finding, transporting and setting up tipis, to co-ordinating logistical details such as the sound system, parking and change rooms for the dancers. He even had to apply for a special permit to dig a small hole in the ground and make a ceremonial fire. Along with trying to accommodate the traditional protocol, the organizers also had to comply with campus regulations and policies—which was not always easy, admitted Tootoosis. It was all worth it, though, when in the spring of 1988, the first powwow was held in the Bowl. "Being part of the process was a lot of fun as it took several months of volunteer work by many students," he said. That experience also came in handy a year later when a new group of volunteers was organizing the next powwow. Tootoosis kept track of the work involved and the necessary protocols that would have to be followed by the organizing committee. Those notes became, "in essence, a small manual for incoming students to read if they were going to help organize future U of S powwows." As the event has grown, the planning and organizational aspect has gotten a bit easier—in no small part to the work of people on campus to ensure its success. "During the last two years I've been here, we've worked really hard to have more campus buy-in in the organization of the powwow," said Graeme Joseph, team leader for First Nations, Métis and Inuit student success with the Aboriginal Students' Centre. "It's a very large event and complex in nature, so we really rely on our colleagues across the institution in order to host it." Joseph added that the importance of the event has grown from a celebration of culture to one of academic achievement. "We have Aboriginal high school and university students who are graduating and what we want to do is ensure we celebrate their success and show people that these students are going to be leaders—not only within their own communities, but across the city and across Saskatchewan." Almost three decades after that initial conversation on campus, Tootoosis is fortunate enough to continue working alongside many First Nations and Métis staff and students at the U of S.
"It feels good knowing that the university continues to support the powwow along with the hundreds of First Nations and Métis students who have worked tirelessly every year to make it possible." The 2016 Graduation Powwow takes place May 25 in the PAC. Visit the website for more information.